Today I celebrated the great American tradition, Black Friday, the way God intended it to be done... by enjoying nature. 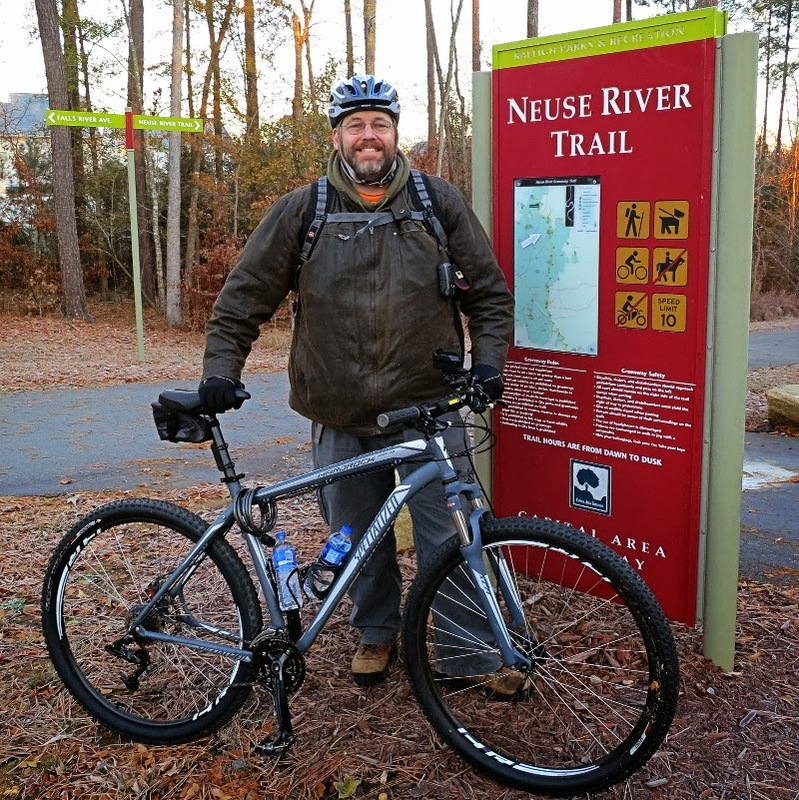 Specifically I biked the Neuse River Trail in Raleigh NC, and did some geocaching along the way. 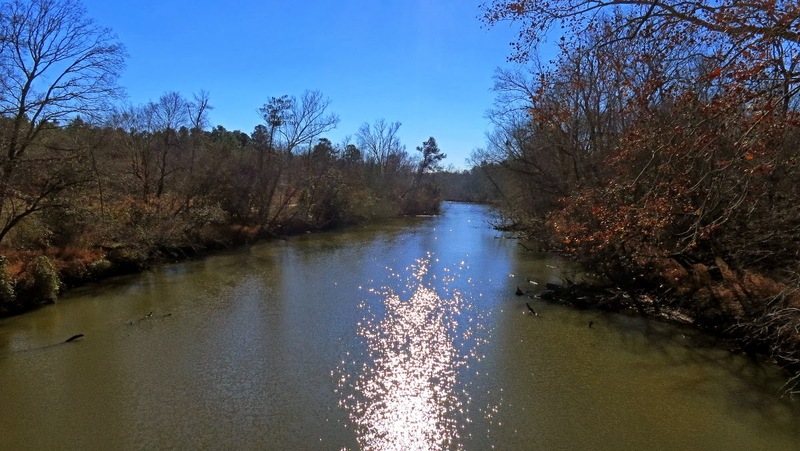 The Neuse River Trail, or NRT, is 27.5 miles of paved trail that runs along the Neuse River on the eastern side of Raleigh NC. 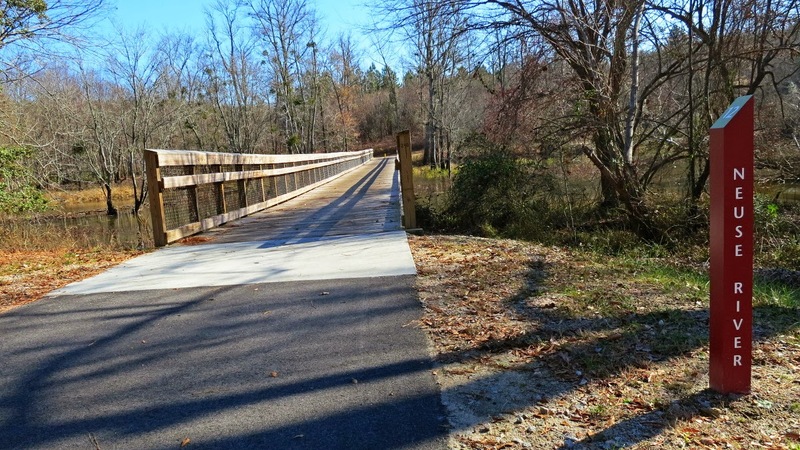 Since we planned on being in Raleigh for the other great American tradition, Thanksgiving, I decided to plan ahead and bring my bike to do the trail. Since days are shorter this time of year, I got my wife to drop me off at the northern end of the trail at daybreak. I then spent the rest of the day biking my way south. 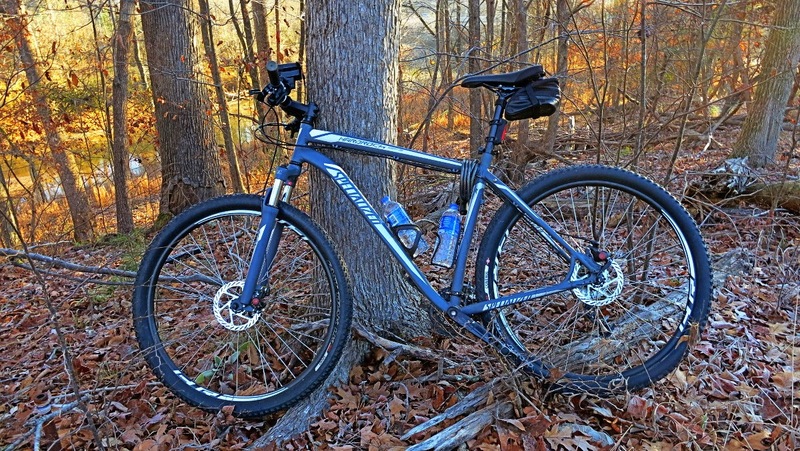 I brought my mountain bike as I expected to ride off trail at each geocache. 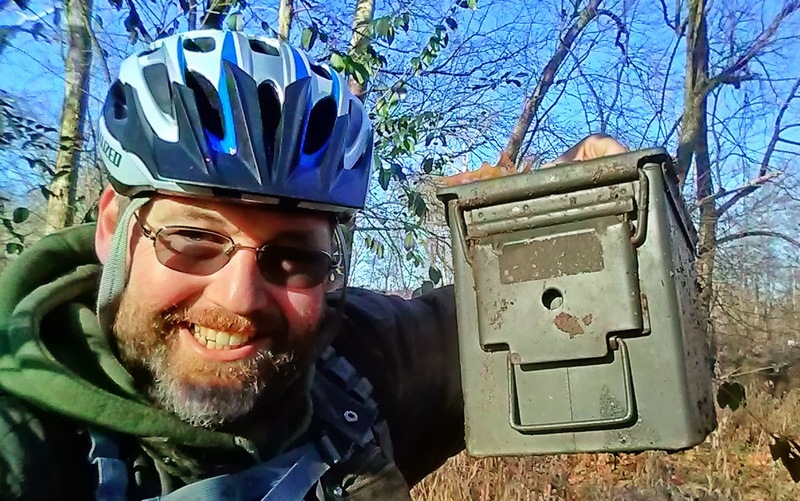 Most of the caches were within 100ft of the trail, so I typically parked by bike by a nearby tree while hunting down those elusive containers. The morning was cold, starting at 29f. I spent the first two hours riding in freezing temps, and riding on frosty trails. 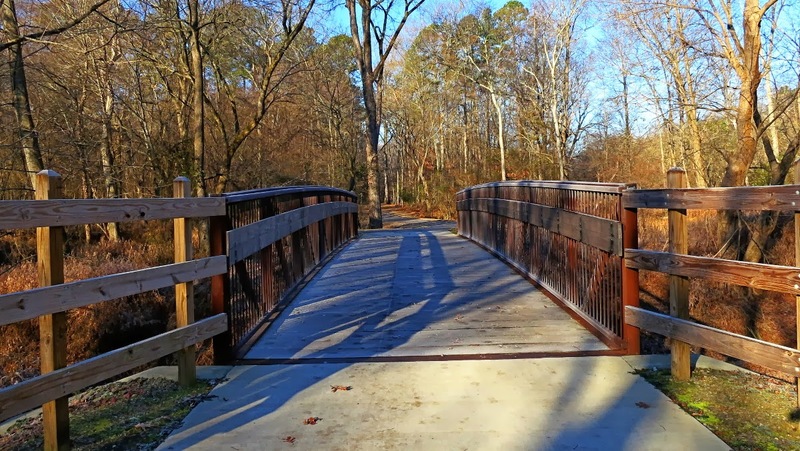 If you look closely you can see frost on the hand rails of this bridge. 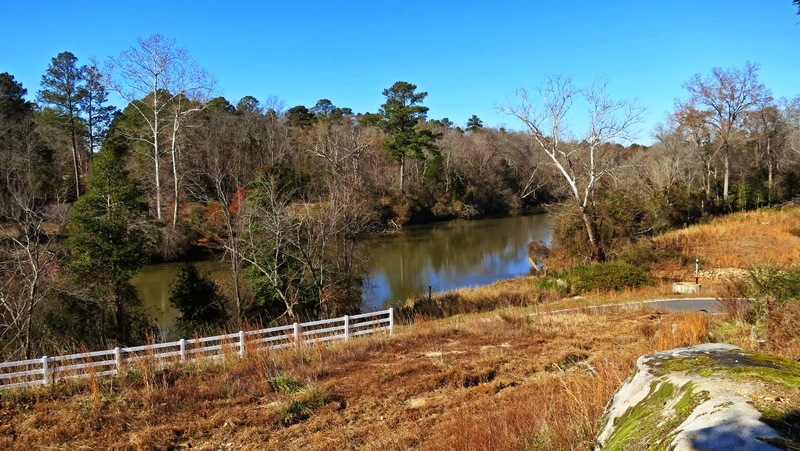 As you may have guessed, given the name, the trail runs along the Neuse river. It actually crosses this river several times. It was not obvious when I set out, but the trail is not continuous. The top 9 miles end at a soccer field complex. I asked some locals how to get to the rest of the trail, but they had no idea. I ended up riding surface streets for a mile or so until I got to the next access point. A rather annoying detour that took almost an hour out of my morning. The cache density is almost like a power trail, but they are much more diverse than a typical power trail. Each hide was unique, and like all good geocaches, highlighted the interesting bits along the trail, like this cache hidden at a river overlook. ... and I didn't even have to set foot inside a store.